I was sitting alone at my table in the darkened Meilori's. The light of my laptop showed the dismal numbers of those who have bought my books this month. Fingertips pressed softly on my shoulder. "May this wayward soul sit down?" I looked up. 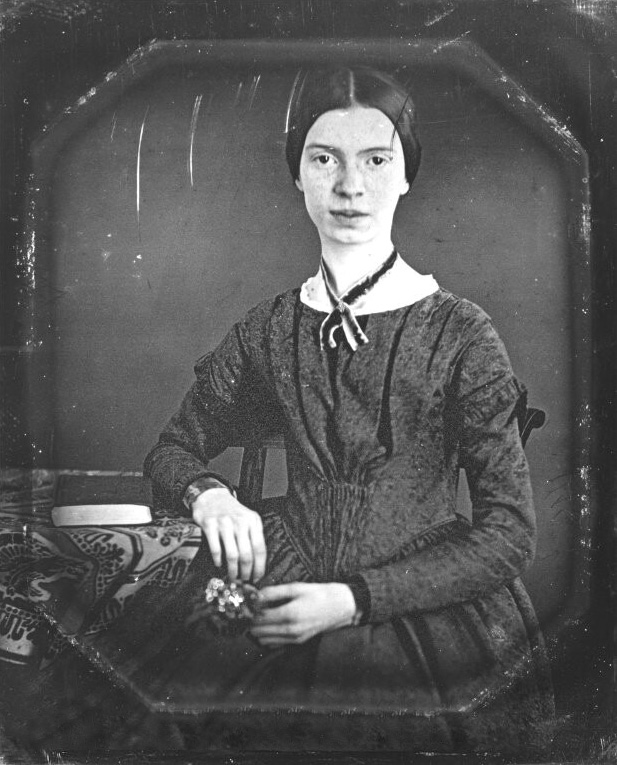 Emily Dickinson, dressed in a black Victorian dress, stood smiling sadly at me. Her voice was gentle, low, and caring. I smiled back. "Of course." I got up and pulled out the chair for her. She flowed down into as lady-like ghosts often do here at Meilori's. As I sat back down, Emily slid a small volume to me. Its cover was dark and light lavender. 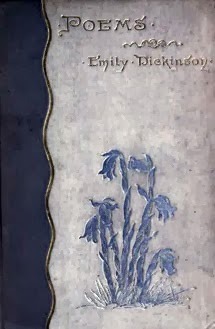 Its simple title: POEMS ~ Emily Dickinson. 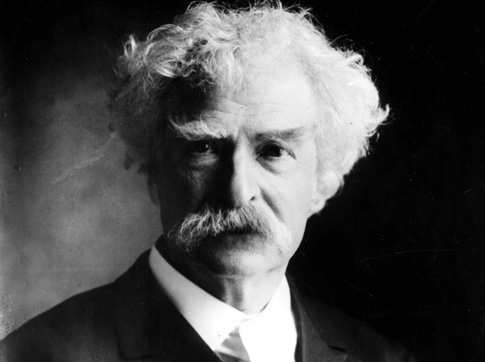 "This first volume of my poetry appeared on this day in 1890, two years after my death. My early editors, the critic Thomas Higginson and family friend Mabel Loomis Todd, made many changes in an effort to make my poems more 'conventional,' but these had not allayed the priggish critics." Emily withdrew a folded newspaper clipping from her dress pocket. 'But the incoherence and formlessness of her — I don't know how to designate them — versicles are fatal…. An eccentric, dreamy, half-educated recluse in an out-of-the-way New England village (or anywhere else) cannot with impunity set at defiance the laws of gravitation and grammar.'" Her hand gently covered mine. "You are of worth, young sir, because you care. Your prose is of worth if only one soul is uplifted because of it." Emily smiled, “I know nothing in the world that has as much power as a word. Sometimes I write one, and I look at it, until it begins to shine. I read one of yours and it does the same." Her eyes sparkled, “We turn not older with years but newer every day. You are newer today than yesterday for you have suffered, you have learned -- so you are a new you." 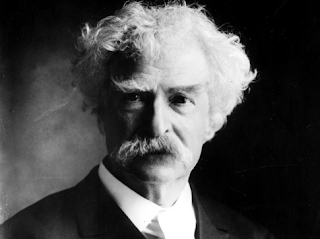 The ghost of Mark Twain sat down beside me with a laugh. "Besides, son, where are those critics of Miss Dickinson here now? Who do folks remember? 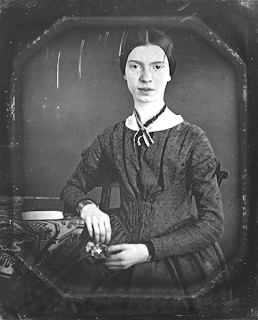 Emily Dickinson or that Thomas Bailey Aldrich?" However, let it go. It is the will of God that we must have critics, and missionaries, and congressmen, and humorists, and we must bear the burden." Emily scolded him. "That is all very well and good, Samuel, but what about your feelings for poor Miss Jane Austen?" Mark looked like he had bitten into a slug. "Agh! You're right, of course. I haven't any right to criticize books. And I don't do except when I hate them!" "I often want to criticize Jane Austen it is true. But, Lordy, her books madden me so that I can't conceal my frenzy from the reader. Therefore I have to stop every time I begin." "Everytime I read PRIDE AND PREJUDICE I want to dig her up and beat her over the skull with her own shin-bone!" Emily gently removed the cigar from his mouth, putting it out defiantly. "It is so heartening to see how you have mellowed with age, Samuel." He glared at me. "Now, you see why gentlemen are a dying breed, Roland." "Or at least a smokeless one," I smiled. I must agree with Twain, I don't much care for the writing of Jane Austen whom some totally love. I get annoyed reading about how restricted women were in those days. I read some poetry, but it's not my first choice of reading matter. As for how Emily wrote her poems - more of a freeform style, that appeals to me. No one remembers the critics, only the creation. I have a couple of paperback editions of classics like Oliver Twist and Jane Eyre that include reviews from those time periods. Needless to say, a few of those reviews are shockingly wrong. I agree with Alex. Well said.